Fortunately (or unfortunately, depending on how you want to look at it), this week’s “polar vortex” won’t be moving as far as St. Mary’s County, Maryland – it’s going to remain hot, hot, hot! If you’ve lived here for a while you’re probably used to these hot, humid summers already. But that doesn’t mean that you have to spend your summer feeling sweaty and miserable! Living in a St. Mary’s Apartment rental can help you keep cool all summer long. Wondering how that works? Check out some ways that living in an apartment can help you avoid the worst of summer’s wrath. 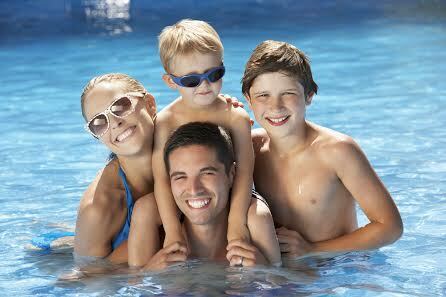 Amenities – The best part of summers in an apartment complex? THE POOLS. We’ve got 2 sparkling pools at our St. Mary’s location. Lay out and get some sun and then jump in the cold pool for a refreshing change of pace. Our pools are kid friendly and are a great place to spend hot summer days that you’d otherwise be spending inside with the AC on. Going to the pool allows you to turn your air up for a while and stay nice and cool outside. Speaking of AC. . .
Lower utility bills – Smaller spaces mean lower utility bills. Buying a single family home will cost you in more than just mortgage and repairs. You’ll also have to pay outrageous electric bills that can force you to either spend an arm and a leg to keep your whole place cool or turn the AC off and sweat it out to keep your bill down. Neither one of those options makes for a very pleasant summer. Keeping your apartment cool is cheaper and more energy efficient! Have more time to enjoy water activities – Buying a home is time consuming. You have to take the time to perform maintenance, do repairs, and keep up with a huge space. Keeping your apartment clean isn’t nearly as much work and you’ve got on-site emergency maintenance in the event that a problem arises. St. Mary’s County has lots of great water activities to participate in that you’re likely to miss if you’re busy trying to deal with home upkeep. Spend your summer doing things that you enjoy rather than things that you have to do. Bet you didn’t know that renting an apartment could make your summer so much cooler. To get more information about moving into your cool new St. Mary’s apartment, call us at 301.737.0737or visit the website so we can tell you a little bit more about why our apartments are the most coveted rentals in St. Mary’s County! For more about renting with Wildewood, check out our Facebook, Twitter, Pinterest, or LinkedIn. This entry was posted on Tuesday, July 15th, 2014	at 2:47 pm	. Both comments and pings are currently closed.